Before we get into this, I have a question that I am sure you all have too, why is Italian food so delicious? From pizza’s to pasta’s to gnocchi, Italian food is just heavenly, the perfect mix of sophisticated and comfort food. We got to hand it to the Italians; they are doing a killer job with this stuff. 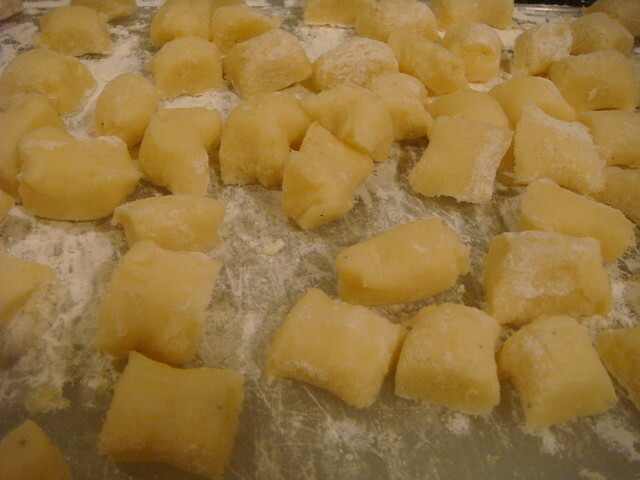 Anyway, if you have had gnocchi you know what I am talking about. Gnocchi is like a potato dumpling, it’s like little potato pillows that just burst and melt in your mouth, drooling aren’t you? What is the secret behind that fluffy potato you ask? This comes with ergonomic handles and so you can use this even if you have arthritis or other pains. Moreover, it comes with 3 interchangeable discs, so you can choose the setting that you want for different kinds of potato mash. The interchangeable discs allow you to use this for other fruits and vegetables too, in order to make purees or mashes etc. 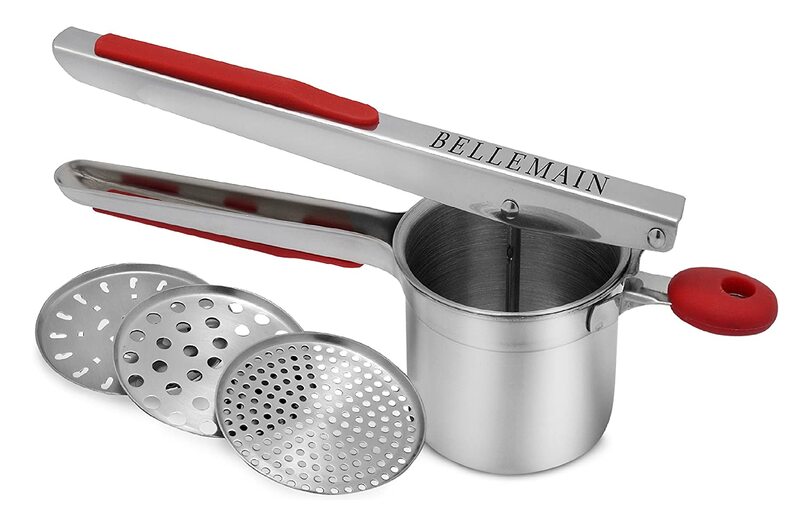 Another great and sturdy stainless steel model, the best thing about this is the rubber handle grips, it ensures that your hands don’t slip while applying all that pressure, and end up making a huge mess. It also has three interchangeable plates, if you want big holes or small holes it has got them both. The hopper is large enough to hold a medium-sized potato so you don’t have to cut the potato first and save up on time. This is such a simple model but it has everything you need in the best potato ricer. It has non-slip knobs and a stainless steel structure. It comes with a single plate but that plate could be used in a very versatile manner and will work best for making gnocchi. In order to turn a dense potato into a pillow, you need a thing called the potato ricer. This trusty little tool will be your best friend when it comes to making gnocchi. The potato ricer turns the dense potato into potato sawdust if that makes any sense at all. It grates the potato so finely that it almost becomes ash and that is the main ingredient in gnocchi. Obviously, it is not just that, because when have Italian dishes not been complicated and technical. Some people find hacks to make the potato that fine if they don’t own a potato ricer. So one of these things include a potato masher or even an electric mixer, but that will never give you the texture that you require to make the perfect gnocchi. An electric mixer would be too harsh on the potato and will release all the starch; this will turn the potato mixture into a sticky mess rather being light and airy. A master will fail to get rid of all the huge potato chunks no matter how hard you try. A potato ricer, on the other hand, looks like a simple enough tool, but this simple tool is actually doing a lot. 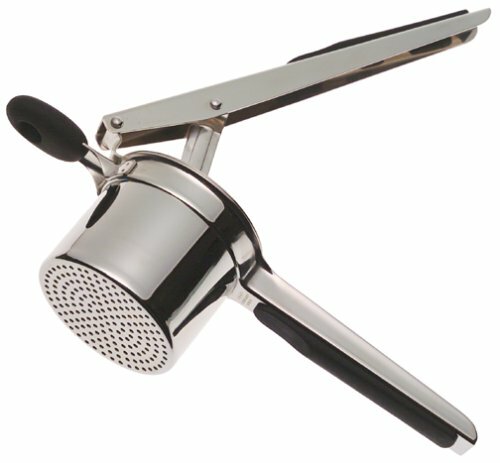 The potato ricer is designed to release the steam from the potato because you are supposed to use this when the potato is hot. The steam escaping also helps the starch stay in check, and you need the minimal amount of moisture in your potatoes so that later when you add flour, you only have to add the minimum amount so that your gnocchi doesn’t become chewy or dense. Do You really need a potato ricer? You may think you can get by without it and maybe use a food mill instead, but the food mill doesn’t do what the potato ricer is doing because the food mill was not specifically made for preparing potatoes for gnocchi. 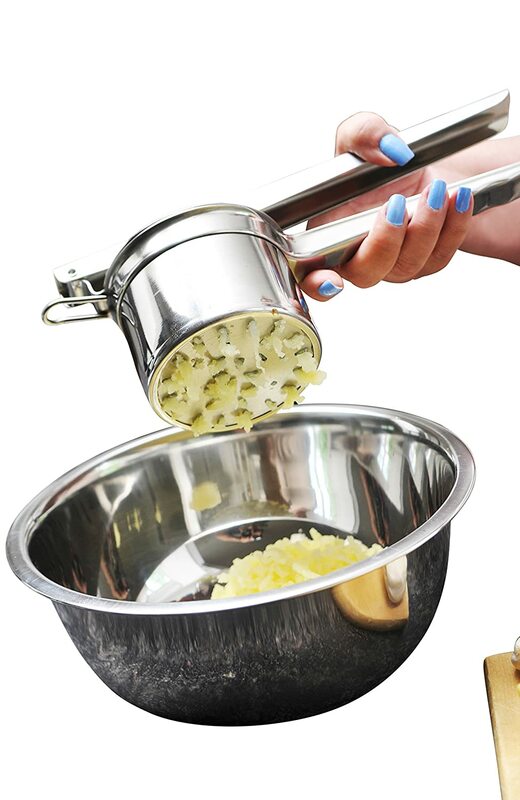 A potato ricer is actually a very convenient tool not just in its functions but because it is so easy to use and handle especially if you are a beginner. First of all the best thing about a potato ricer is that it doesn’t require any electrical power, it’s a good old school manual tool. The fact that it is handheld and portable makes it simple to use, all you have to do is apply pressure to get the potato mashed into exactly the right texture. A potato ricer is also super easy to clean, it’s a compact tool and it does not take too much effort to clean this up. Let’s talk about the very best feature of a potato ricer; so raise your hand if you hate peeling potatoes because it takes forever and is literally the most annoying thing to do, I am pretty sure all hands are raised. Well, you don’t have to worry about the peeling if you are using a potato ricer. Just cook your potatoes without going through the struggle of peeling them, and when you pass them through your potato ricer; it will just leave the skin behind. Easy, no? What to look for in a potato ricer? Potato ricers come in all shapes and forms, a lot depends on the price you are paying for a potato ricer. But there are some features that should be present in any good model. So before you go get yourself a potato ricer, there are a couple of things that you need to be looking for. A good potato ricer needs to be sturdy because otherwise, it will not do the job like it’s supposed to. You need it to be strong enough to push a dense potato through to turn it into a fine mash. Durability is another factor that you should always be on the lookout for. You may find plastic potato ricers and they will cost so much lesser than a steel one, but plastic won’t last and it won’t be able to take the load. The size of the holder should be big enough to accommodate either a whole potato or at least sizeable pieces of a potato. This component of the potato rice is known as the hopper and is one of an essential component of the entire concoction. There are a number of other small things that you need to consider because these small things can make a huge difference to your final results. Let us talk a bit about the holes present in the potato ricer, some people believe that the size of the holes matter and that smaller holes will prove better results. That is debatable however one thing is for sure the number of holes matters a lot. Always choose a potato ricer that has a good number of holes because those will you will get the work done quicker. It is almost as an impossible task to make the potato go through the ricer again and again, especially after it no longer holds its shape. Another little thing to keep in mind is the press apparatus; this is basically what the entire potato ricer tool depends upon so you can’t mess that up. And then, of course, there are the handles, a good grip will make sure your hands are no exhausted afterward and also make the process ten times easier. Try looking for ergonomic handles to make things even easier if you are left-handed. Now that you own the tools, better get to work on that delicious gnocchi you have been wanting to make.